This has taken so long and while i have showed to our familes, my cell & Ww's cell it's time it get to be seen by the world. Anyway that heartshaped blackish thing is actually the waterbag and the little patch at the corner is baby who's only abt 13.8mm then. 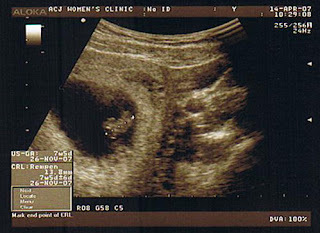 the 4 white dots is actually the computer ruler thingy lar..not part of the baby. 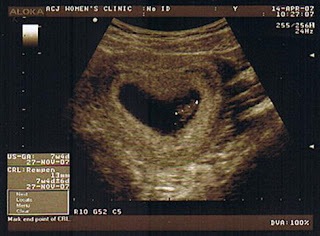 we saw baby's beating heart (very fast), head, little dots which my gynae said its' the hands and legs. In a way it's a whole different thing to see baby via ultrasound...like i really felt there REALLY is a new life inside me. Honestly baby's arrival is quite unexpected (we were planning to start planning end of this year) plus i just found a new job and only discovered 3 days before my first day of work...and so i have kinda mixed feelings about it. Tho Ww has super excited haa...and started telling the almost the whole world as soon as we 'confirmed' it. Still God's timing is really beautiful, just as we remember the bible verses we chose for our wedding in Ecclesiastes 3, that God has made everything beautiful in His time, so is baby part of that beautiful timing of His and i'm glad. anyway this is how u find out if you're really pregnant after the signs seem to bug u.
bought 2 for $19.90 which is...hmm.. i think expensive tho. and it's fast way to find out. more on other things soon i hope..meanwhile at coming to week 10 of pregnancy, my morning sickness seems to be taking a turn for worse. i'm losing my appetite even tho i would love to eat but food seems to want to come out. my succesful 'throwing-out' count is 4 so far...(i hate to throw out really...so i try not to but sometimes after throwing-out i feel better...tho not for long. thank God for public holidays anyway, rest is a gem.